If the very idea of seeing the dentist provokes deep-seated fear that drains the blood from your face, there is a good chance you are one of the approximately 40 million people who suffer from significant dental anxiety. This negative outlook on dentistry most often develops in childhood. Once you reach your adult years, fears related to an early dental experience are rooted, and they can stand between you and your oral health. You may not remember a bad dental experience. You may not even fully understand your reasons for feeling unnerved whenever it comes time for that checkup and cleaning. 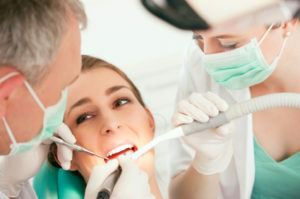 Ultimately, uncovering the cause of dental anxiety is the least of our worries. What we focus on when meeting with patients in our Warrensburg, Windsor, or Oak Grove office is meeting the needs of the moment, and that means comfort. Tuning in. Music is excellent therapy for the anxious mind. A direct benefit of plugging in the headphones during dental care is that you do not hear as much of the noise of the dental office. Whether the dental drill is being used in your treatment or a nearby room, the sound can result in feelings of anxiousness. Drown it all out with your favorite tunes. Speaking up. One of the best things you can do if you hate seeing the dentist is to tell your dentist how you feel. We won’t let it hurt our feelings, promise! Clear communication about dental anxiety opens the door for us to develop strategies around your unique needs. Avoiding the hype. Did you know that sugar and caffeine can increase the activity of the central nervous system? Perhaps that cup of coffee on the way to the dentist should be skipped! During moments of anxiety, most people stop breathing normally. Breath becomes shallow and infrequent. The lack of proper oxygenation increases the nervous response. Breathe. Ahhhhhhhhhh! Ridgeview Family Dental is committed to patient-centered care. It’s all about you here. Contact us to schedule a visit, and to learn how sedation dentistry could help you through necessary dental care.